Thank you for giving us this opportunity to share with you parent perspectives on evaluating our schools. While this letter mainly speaks to HB 5112, some later comments are also relevant to HB 5111. Other witnesses have discussed the details of the proposed evaluation system, so we do not address them here, except to point out that what we measure indicates what we value, and everyone--parents and citizens alike--value a much wider range of things about our schools than just test scores in two or three subjects. Test scores can tell us a little, but we really need to know more. That is really the key to our perspective: any effort to sum up the "quality" of a school in one letter grade or color code does not help parents much at all. In fact, letter grades can be even more misleading because they prompt a "gut" reaction even though we might not be sure what they truly mean or measure. 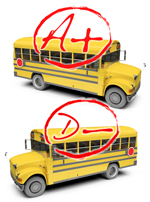 "Grading on a curve," specifying the relative percentage of school to receive each grade makes it worse, with the number of top and bottom grades pre-determined. Parents want to know many things about the schools in their community, because all of it affects the education the schools offer. We want to know more than just test scores, including: information about graduation rates, safety, success after graduation, innovative programming, access to classes in the arts and music and to a range of athletic opportunities, how technology is used, how the schools approach teaching children at different developmental levels, how the schools handle children with disabilities or other obstacles, and so on. These factors are all important, and every family will have their own priorities to evaluate. There is a more important reason to provide more information. As parents and citizens, we are owners of our schools, not just consumers. We deserve to know what is working in our schools, what is not, why this is the case, and what we as a community can do to make things better. As current parents, our interest in great schools for our community did not start when our children reached kindergarten, and it will not end when they have graduated high school. Part of living in a community is the obligation to take steps to improve the community for everyone. Finally, I'd like to note that both HB 5112 and HB 5111 appear to be based on the assumption that if schools are not performing well on certain measures, they must not "be doing their job." Sometimes that may be the case. Far more frequently, in our experience, schools struggle with tasks they do not have the tools or resources to fully address. We are fully justified in asking a great deal of our schools; we must also ensure they have the ability to do what we ask of them. The MIPFS Board of Directors is joined in this message by the leadership of Parents for Thornapple- Kellogg Schools, Friends of Dexter Community Schools, the East Grand Rapids PS PTO Legislative Committee, Friends of Kent Co. Schools, Forest Hills Families Supporting our Schools, and other parent advocates around the state.